MISSION ACCOMPLISHED!! Fred Donner (National Smokejumpers Assoc. ), Tony Woods, (Philly Inquirer) and Trooper Robert Murphy Matthews of the 555th Parachute Infantry Association display the flag of Baltimore chapter of the 555th, at the headstone and grave of Pvt. Malvin L. Brown, US Army. They placed an American Flag on his grave! Private First Class Malvin L. Brown is listed as the first Smokejumper to perish on a fire jump. I have been working with the National Smokejumpers Association (Carl Gidlund) for many years trying to get information on Trooper Brown. I received an email and photo of his headstone from Fred Donner, they located the site. We are still trying to contact any living family members of Malvin Brown. We will be working with the NSA to maintain this site and install a historical marker. Joe Murchison, National President, 555th Parachute Infantry Association, Inc. THE SEARCH FOR MALVIN L. BROWN’S GRAVE By Fred Donner (Missoula ’59) On May 15, 2014, a newspaperman Tony Wood, and myself found the grave of Pfc. 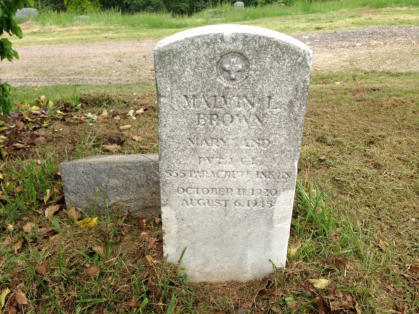 Malvin L. Brown who died on August 6, 1945 when he fell from a tree on a forest fire in Oregon. Brown was a member of the 555 th Parachute Infantry Battalion or “Triple Nickles” - Nickles is not a typo but their chosen distinctive - an all-black unit. The 555 th had been deployed to northern California and Oregon in 1945 to reinforce the draft-depleted smokejumper program that was facing the Japanese balloon bomb threat. They were then trained as smokejumpers by the U.S. Forest Service. Brown was the only Triple Nickle to die and is considered the first smokejumper to die on duty. The National Smokejumper Association (NSA) and the Triple Nickles Association (TNA) became interested in recent years in finding his grave missing since 1945 with the intention of placing a historical marker. The success of Tony and myself is due to four key people. In the July 2006 “Smokejumper” magazine NSA historian Mark Corbet (LGD -74) published an extensive article “The Death of Pfc. Malvin L. Brown: In the Interest of Public Welfare.” Carl Gidlund (MSO-58), an unofficial liaison link between the NSA and the TNA, also developed some information. All leads pointed to Philadelphia or Baltimore environs. With Mark in Oregon and Carl in Idaho the NSA was looking for someone on the East Coast to investigate the evidence and I took up the challenge. In 2008 I received an e-mail from Chris Sorenson (Associate) with the address of a likely cemetery in Baltimore that he had obtained from an internet search. Mark, Carl, and Chris are thus the first three key people. Anyone can Google “Triple Nickles” or “555 th Parachute Infantry” and find ample websites with the history of the TN and the 555 th including the death of Malvin Brown but will find no information on where he is buried, at least not that any smokejumper has ever seen. I recognized the address as a most unlikely location in downtown Baltimore, no fault of Chris, since I once delivered courier packages there in a part-time retirement job. But John Maclean (Associate) and I went there anyways just to say we’d run out every lead. It was clearly downtown. What would Sherlock do next? We went to a shopping center in a black Baltimore neighborhood on a rainy winter Sunday morning and started asking people if they knew of a black Mount Calvary Cemetery. Miracle one - someone directed us out into Anne Arundel County. Not finding anything we stopped at a sheriff sub-station. Miracle two - a black lady sheriff’s deputy told us where it was not far away. We spent hours there and turned that place inside out and upside down finding no Malvin Brown although there were other WW II veterans there in a cemetery with a lot of weeds and brush obscuring faded markers. Later I called a phone number seen on a maintenance shed and talked to a lovely black lady who has turned out to be one of the owners of the private cemetery and she could find no “Malvin Brown.” I was clear that I was looking for a Malvin Brown, not a Marvin Brown. Thus ended the hunt for five years. In October 2013 Joe Murchison, TNA president in Tampa, FL, sent Carl a copy of a War Department document “Application For Headstone or Marker” for Malvin L. Brown. Carl sent it to Mark and “Smokejumper” editor Chuck. Chuck sent me this message: “Fred, Is this something you can do?” I said I will give it the old college try one more time when spring arrives and that’s it. Joe Murchison just became the fourth key person in this saga as he had just reopened the search. Miracle three - I Googled “Malvin L. Brown.” I found an article from the “Philadelphia Inquirer” of August 16, 2010 by Tony Wood. The article started out about scientific research on the jet stream, moved into Japanese balloon bombs launched in an effort to burn off the western states in the 1945 dry season, touched on the Bly, Oregon event of May 5, 1945 when a balloon bomb exploded and killed a pastor’s wife and five children, not their own, on a picnic, (see my article on the Bly event in the July 2013 “Smokejumper”) and went on to the Triple Nickles and the death of Malvin L. Brown. Had I not Googled the middle initial you would not be reading this because I would not have found Tony Wood. I contacted Tony in April 2014 because he was from Philadelphia as was much of the Brown information. I sent him all the info Mark, Carl, Chris, Joe, and I had gathered. He was most grateful because he always wanted to follow up on Brown but didn’t know anybody with more information. We had census information and high school information on Brown that placed his young years on the “Main Line,” the affluent socialite area coming west out of Philadelphia with gentry homes, large estates, and horse farms. Also on the “Main Line” are black communities where the people lived who worked in those homes and tended those grounds. There was some evidence Brown had been buried in Pennsylvania near Philadelphia. The body had been shipped to a certain funeral home in that area. I suggested to Tony, whom I hadn’t met yet, that he check out that home and he found its successor had no old records. Tony also ran into dead ends on some possible names of relatives and some addresses derived from old records Mark had uncovered. But there was also evidence for Baltimore. The headstone was to be sent to a Baltimore address intended for Mount Calvary Cemetery. I had Google-mapped that address and it was clearly redeveloped. He had been buried in August 1945 but the headstone was not applied for until April 1946 in a Pennsylvania courthouse and was not ordered from Vermont until July 1946. I saw many possible glitches. However I had an increasing feeling we were in the 20-yard red zone. Then Tony Googled the Mount Calvary Cemetery and found a phone number on the internet. I had called this number repeatedly and never gotten an answer last winter. Now Tony got an answering machine. Shortly he was called back by one of the family owners, brother of the lady I talked to five years ago. Miracle four - this brother had come from the Virgin Islands for one month to help clean up the cemetery and had put an answering machine on the usually unattended cemetery phone line. I had talked to his sister on her home line. Tony asked if they had a Malvin Brown. Jim said they had a “Marvin Brown” in the records, an obvious typo as it turned out, and added as an apparent afterthought - he died on August 6, 1945 in Oregon! (I had never mentioned the date or place when talking to his sister five years ago. I was simply asking for Malvin Brown.) At this point Tony sent me an e-mail and said “I think we have it. Get back to me.” I was looking at my screen and said “I’m right here. What’s up?” Tony told me what he just learned and said the guy is outside taking pictures and will get back to us. 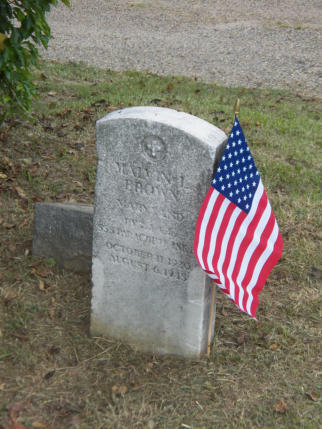 Jim took pictures of a gravestone that said “Malvin L. Brown, Maryland, Pvt. 1 Cl., 555 th Parachute Infantry Bn., October 11, 1920, August 6, 1945” and e-mailed them to Tony. A few minutes later Tony was looking at the photo on his computer in Philadelphia and I was looking at the same photo on my computer in Virginia. I said to Tony, “Are we beyond a reasonable doubt? Can we go public?” And Tony said, “Let’er go!” But for the presence of that letter “ell’ in the name and in the middle initial, this case could have continued in obscurity. Was this God’s plan, was this coincidence? Depending on your theological framework, take your pick. 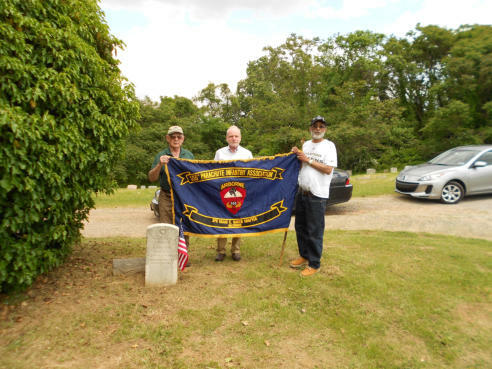 On Memorial Day Weekend 2014, Tony Wood, Bob Matthews of the Baltimore Triple Nickles, Denis Symes (MYC-63), and myself placed an American flag on the gravesite of Pfc. Malvin L. Brown. May he RIP, God bless his soul. THE JUMPERS AND THEIR STORIES Malvin L. Brown (Pendleton ’45) – Aug. 6, 1945 by Chuck Sheley Twenty-two-year-old Malvin L. Brown walked into a Philadelphia Army recruiting station Oct. 11, 1942, and signed up. At that time he had a grammar school education, a job driving trucks, and a girlfriend. After completing Army basic training, Brown heard about an all-volunteer African American paratrooper unit. Recruits voluntarily transferring from other Army units were filling the group’s ranks. Brown met the requirements for entry, volunteered, and was accepted by the newly formed 555th Parachute Infantry Battalion. He took his paratrooper training, and later medical technician training, at Fort Benning, Ga. Orders were issued May 5, 1945, for the 555th to report to their new permanent duty station at Pendleton, Ore. Japanese balloon bombs had begun arriving in North America during 1944 by way of high-altitude winds that would eventually be called the jet stream. These balloons, mostly made of paper and filled with hydrogen, carried six incendiary bombs and one anti-personnel explosive charge each. U.S. war planners were concerned that balloon bombs might ignite massive forest fires during the coming summer of 1945, diverting manpower and resources away from the war effort. A massive civilian and military effort was put into motion to combat the threat. Cross-training paratroopers as smokejumpers and bomb-disposal experts was one part of that effort. 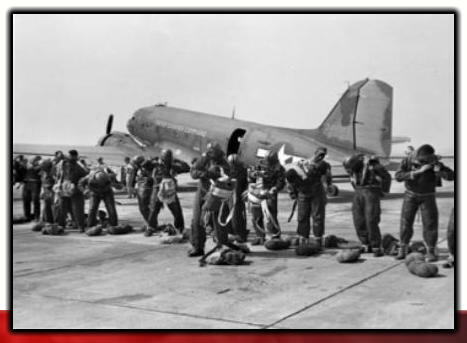 A call came in to Pendleton Monday, Aug. 6, 1945, for military smokejumpers. Their mission would take them southwest across Oregon for nearly 150 miles to the Umpqua National Forest. Ten jumpers, including Brown, would jump the fire located near Lemon Butte, 38 miles northeast of Roseburg. It was burning in the tall timber of western Oregon where 200-foot-tall trees are common. No one knows for sure what went wrong, but at 5 p.m. Brown began to slide down his rope after landing in one of these tall trees. He somehow lost his hold on the rope. Reports say he fell approximately 150 feet into a rocky creek-bed far below. Death was believed to be instantaneous; the cause of death was officially listed as basal skull fracture and cerebral hemorrhage. That night and the next day, Brown’s body was carried out to a road more than 15 miles away by his fellow paratroopers, arriving at 7 a.m. on the second day. Four days later his remains arrived by train in Narberth, Pa., and were turned over to his new wife, Edna, whom he had married after entering the Army. To date, the NSA has located where he was buried. In recognition of the men who parachuted to the Lemon Butte Fire in 1945, the Umpqua National Forest named an overlook – where some forest employees watched the jump – “Fireman’s Leap.” Brown was born Oct. 7, 1920, in Baltimore, the fifth child of Steve and Ethel Brown. He was 24 years, nine months and 29 days old when he died. Private First Class Malvin L. Brown is listed as the first smokejumper to perish on a fire jump.